Annual Southcoast Health - Hero for Health Award is presented to outstanding leaders who, through their work, advocate for optimal health and wellness in our region, state and country and thus exemplify the mission of Southcoast Health. 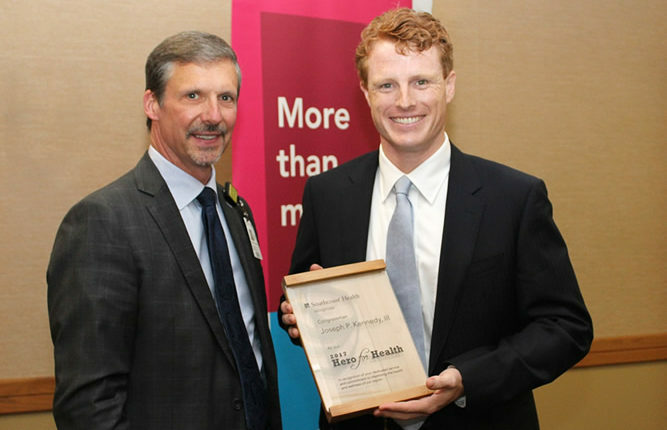 Southcoast© Health today announced that Congressman Joseph P. Kennedy III has been named the recipient of the 2017 Southcoast Health – Hero for Health Award. The annual Southcoast Health – Hero for Health Award is presented to outstanding leaders who, through their work, advocate for optimal health and wellness in our region, state and country and thus exemplify the mission of Southcoast Health. Since being elected to Congress in 2013, Congressman Kennedy has taken the time to learn even the most complicated healthcare issues and has amassed an impressive legislative record. He has sponsored or co-sponsored 157 bills aimed at improving healthcare and access to care for and the nation’s children, seniors, and low-income residents. He has worked with the Massachusetts Congressional Delegation to prevent damaging cuts to all of Massachusetts’s hospitals. And he has been a leader in opposing efforts to reduce access to healthcare for the nation’s low-income citizens. A graduate of Stanford University and Harvard Law School, Congressman Kennedy spent two years with the Peace Corp in the Dominican Republic. There he designed and implemented an economic development project near Puerto Plata. He is fluent in Spanish. Prior to being elected to Congress, he served as an Assistant District Attorney in the Middlesex County and the Cape and Island’s District Attorneys’ Offices. His experience enables him to be an informed and effective advocate for other improvements that affect health and wellbeing — including education and economic development. “The award reminds us that great healthcare takes great civic and government leaders, because those of us who work in healthcare cannot do it alone,” said Hovan.